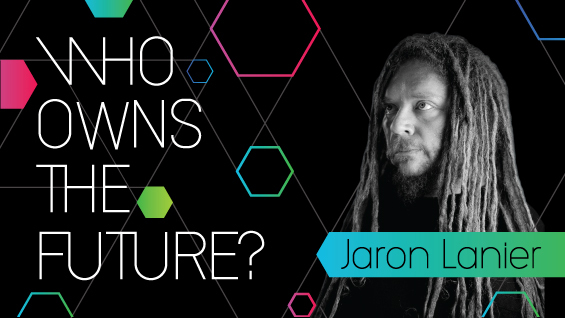 Author's Talk with Jaron Lanier: Who Owns the Future? Scientist, musician and bestselling author Jaron Lanier–the father of virtual reality-- argues that the rise of digital networks—Facebook, Twitter, Google, and others—has led our economy into recession and decimated the middle class. Now, as technology flattens more and more industries, we face even greater challenges to employment and personal wealth. In Who Owns the Future?, Lanier envisions a singularly bold model for a highly humanistic economy—one that will reward people for the valuable information they share with networks and the companies that control and profit from them. Jaron Lanier is the bestselling author of You Are Not a Gadget and one of the most influential thinkers of our time. He received a Lifetime Career Award from the IEEE in 2009 for his contributions to the field. Time Magazine named him as one of the “Time 100” in 2010. A profile in Wired Magazine described him as “the first technology figure to cross over to pop-culture stardom.” He has worked both in an academic context, particularly in connection with Internet2, and in the private sector, helping to create companies that were eventually acquired by Oracle, Adobe, and Google. He received an honorary Doctor of Science from NJIT in 2006 and a 2012 honorary degree from Franklin & Marshall College. Lanier also writes orchestral music and plays a large number of rare acoustic musical instruments. He is currently a partner architect at Microsoft Research.